One of my Christmas vacation goals was to renovate the blog and thereafter, get a post up semi-regularly again. It's taken longer than expected, but here it is. I missed this place! Last year was sporadic at best, and I seriously missed the time of reflection that blogging brought to my life. Nothing made that more evident than my lack of a one word last year. It's not that I centre my whole life around my one word. In fact, I'm not always very good at focussing on the goals the word is supposed to represent. But God has used my various words to speak into my life, help me find some themes in certain seasons, and really just have something to anchor my journey and growth in for the year - be it spiritual, personal, professional, academic, or otherwise. All that to say, I resolved to find a word for 2017. I want to be more aware of God's presence this year. I want to be open to it, to be actively listening for Him, and to be aware that He is present and working in every moment, every situation, every life. I want to be present right where I am, wherever that happens to be, in whatever I happen to be doing. As a student living in 4-month bursts, it is so easy to look to next semester, to the summer, to my co-op placement next year, to what's next? after graduation. More than that, I am also involved in a lot of different things at school, at church, with Compassion, and personally, and it is so easy to be doing one thing while thinking about something else entirely. But I want to recognize that God is doing something right here. Right now. In each moment, something is happening and more often than not God is orchestrating something beautiful before our eyes. And I want to be present for that. I don't want to miss out on the incredible things He is doing in the here and now. I don't want to sleep through the important moments. I want to stand in the river, expecting God to do something big if I show up, be present, and expect Him to move in world-shaking ways. That is my #OneWord2017! A few concrete New Year's resolutions include blogging regularly, continuing to build the skill of speaking as I speak at gatherings and events, and reading the entire Bible this year. I am glad to have this space refreshed and revived and I am so looking forward to the year ahead! How about you? 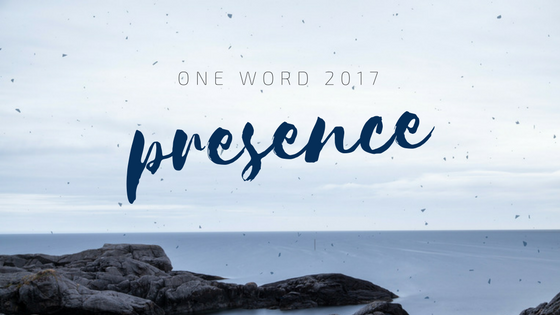 What's your #OneWord2017?